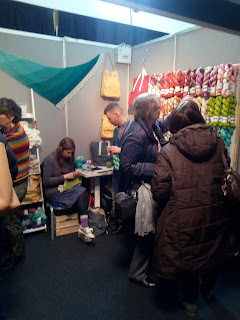 There were a number of reasons for my return visit to Scotland, one of the most exciting was the Edinburgh Knitfest. 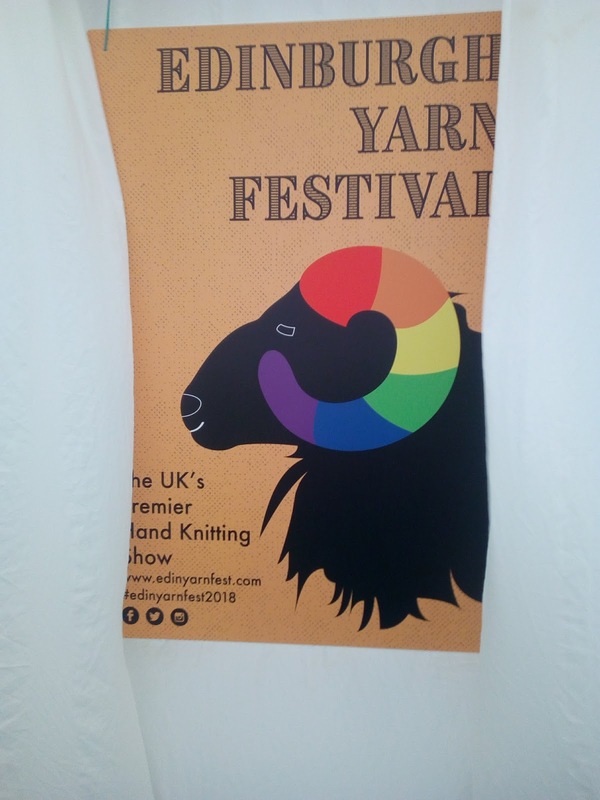 Since knitting became the cool and trendy favourite pastime of the young - EYF has to be one (if not THE) trendiest of events in the UK knitting calendar and I was really looking forward to being on the crest of the coolness wave for a change. My usual place is treading water in the rock pool after the wave has receded and the tide is barely a line of blue in the distance. You don't believe knitting is cool!? Well try this little snippet featuring the lady I saw on the bus going to the event. I was sat at the back of the bus anxiously watching for signposts or clues about where to get off when I began to notice a large number of hand knitted hats and scarves dotted about the bus and stood at the front, a lady with turquoise hair who filmed us all and then asked all the hand knitters on the bus to raise a hand. It seemed like the entire bottom deck of the bus was going to the Knitfest, so I followed everyone else - there was no possibility of getting lost. 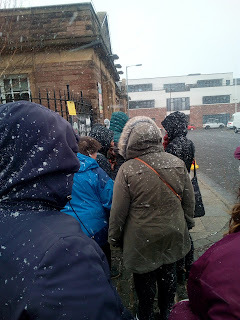 My only anxiety after this was the weather and the fact that I was queuing. By the time I knew for certain that I could make the festival all the advance tickets were sold out and I had to leave it to chance and the queue. The weather was a windy -1C with snow. I am no longer accustomed to such stuff. Now I'm going to gloss over the horror I felt when someone told me their sister had queued for over an hour the day before. I only waited about 10 minutes. It was warm inside, and full, I mean FULL of yarn and fibre goodies from all over the world. Colour senses overload! I was not as well prepared as I thought. I had a rough list of things that I wanted to purchase or look at. 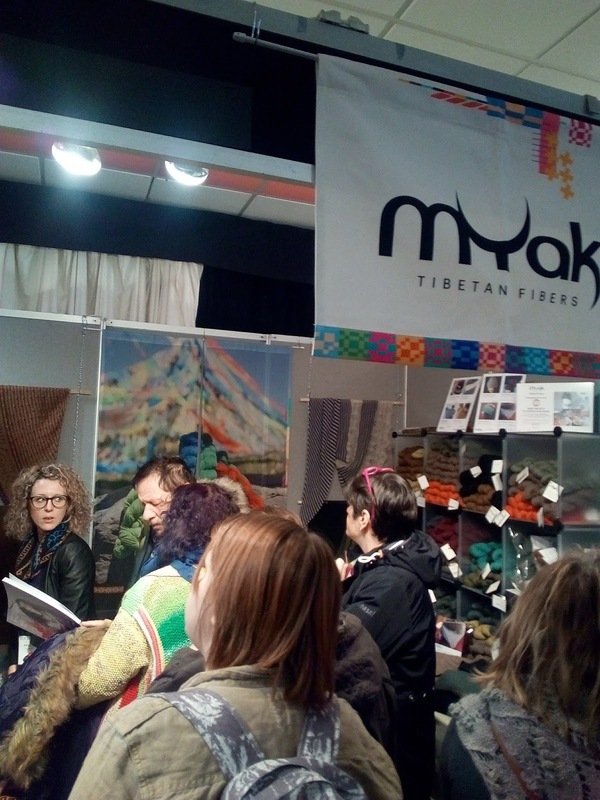 I knew one of the suppliers that was there and intended to purchase some wool from her for a jumper pattern I bought when she was at the Loch Ness Yarn Fest. 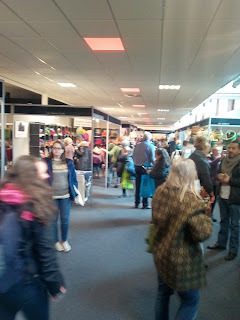 I walked around the hall aimlessly for the first hour before I realised I needed a plan of the hall with a list of vendors. When I found her it turned out I'd passed her stand twice and not noticed - too many sparkly pretty things either side! Or perhaps this is evidence of my taste in yarn - subdued, subtle even. Shopping in this kind of atmosphere is fraught with danger. You are surrounded by people in a shopping frenzy and with every breath you take on board not just oxygen but the desire to exchange the notes in your purse for some squishy soft woolly delights. Its a pandemic! But it's hard to decide which, or what will cure and what will just make your symptoms worse! Some purchases lead to others like patterns lead to wool which leads to needles and stitch holders and markers and yarn guages and needle guages and one of each is NEVER enough. Too much choice leaves me unable to decide and in danger of buying nothing. Oh no! This cannot be! The most popular choices are skeins of varied coloured or multi coloured or gradient coloured wools in every shade of the rainbow and then some. 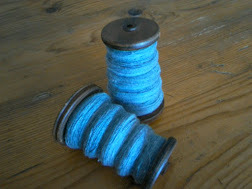 The cost of some of these skeins can be as much as £15. But there is simply too many different hues to be able to choose just one. 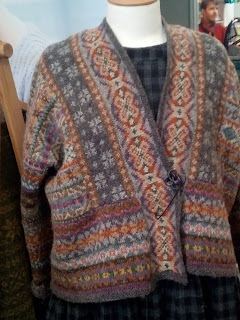 And just one would make a hat, or a scarf or perhaps gloves but not all three. 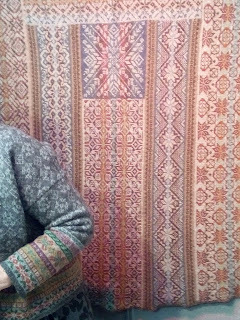 There's only so many hats and scarves a girl can use (especially if you live in Spain). 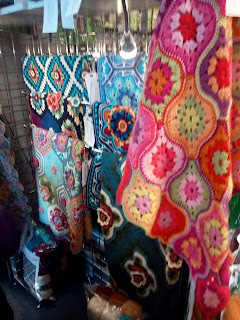 So I admired much of these but purchased little. Likewise I passed by the stand called Socks Yeah. 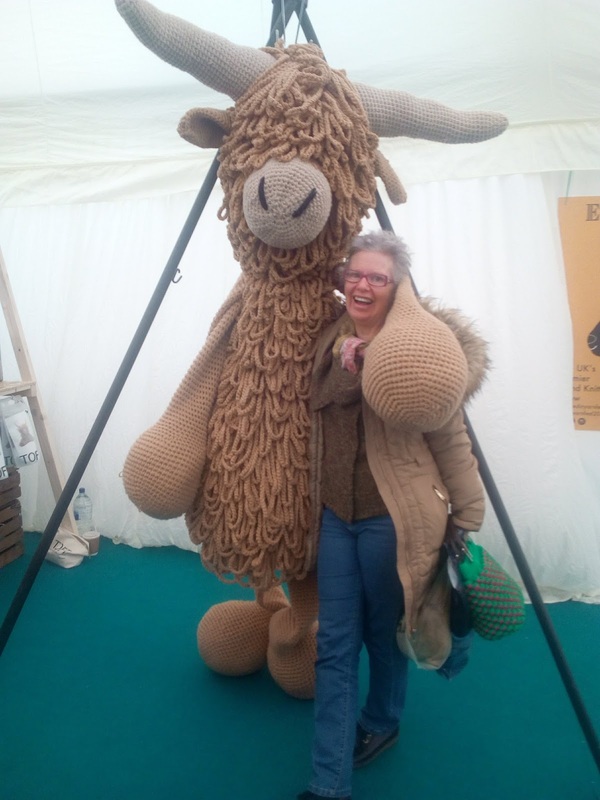 My favourites are the single breed wool in natural shades straight from the sheep. 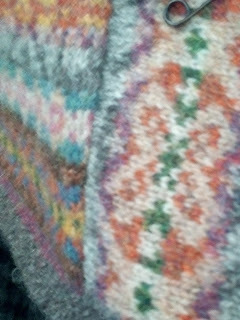 Or the gentle dyes of the fairisle patterns. Timeless, classy and ageless - or perhaps they're not. Perhaps they are old fashioned, a bit like me. This is what I'd like to achieve with my local wool but I will seriously have to up my game. 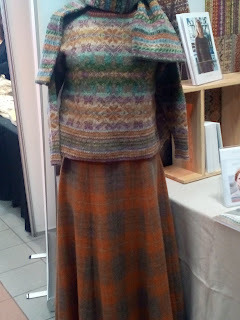 Or perhaps if I want to attract interest from younger knitters I should try to emulate the wilder colours that are perhaps what has been fuelling the rise in popularity of knitting in general. I did get to try out a spinning wheel that I've heard alot about but of course would normally not get the opportunity to try before buying. It's the Schacht Ladybug. 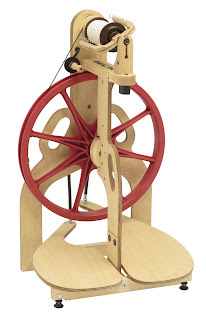 A beautiful, small, portable wheel that spins like a dream but doesn't seem to offer anything different than my Lendrum and is surprisingly complicated to set up (or perhaps I'm not very wheel savvy) by comparison. Remembering how nervous I was about purchasing my newest Lendrum without being able to try it first I am now patting myself on the back. The Ladybug was cute and kinda cool but my Lendrum is better 😁. Only one thing could have improved on the day. 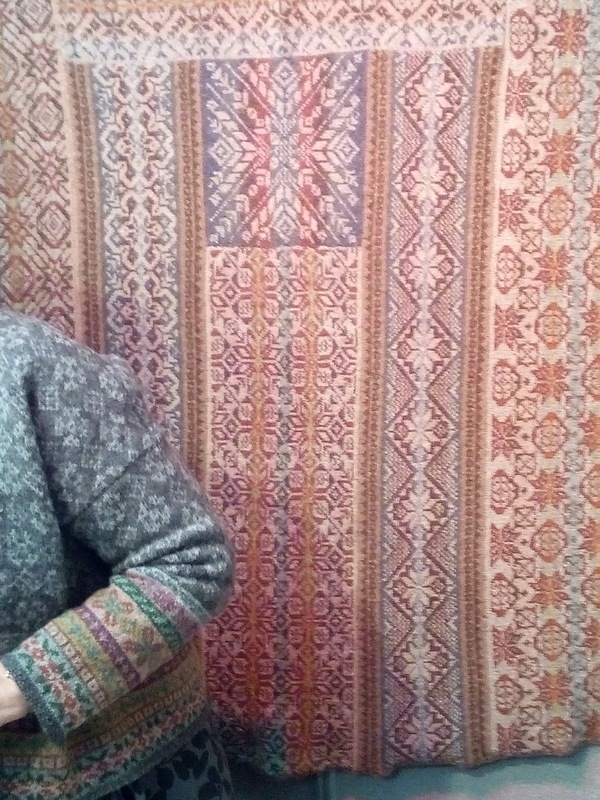 If I had taken a friend and some knitting. But I had neither with me. Although knitters are always happy to chat with other knitters and it wouldn't have been hard to make new friends I didn't really make the effort. Although I did find someone willing to take my photo with the Heilan' Coo! Needless to say I had a wonderful time, spent a pile of money, came home exhausted and with a cold but soooo happy I went. Can't you tell?